There are many reasons to purchase leather goods. They are durable, smell amazing, and can be styled in so many ways. Ultimately, people who are looking to purchase leather goods are looking for something special (either as a gift or for themselves). Owning a Beargrass Leather adds value to an already amazing experience of committing to a quality product. People can feel the artisan difference in every product. Leather goods are not just a fashion statement, they can help define your persona for life. Showing up to the lodge with an amazing Weekender bag, or going out for an anniversary with a cobalt blue Artemis sets the stage for something amazing. The vision of Beargrass Leather is a dedication to making heirloom quality leather goods in the style of the American West. Design is what truly makes Beargrass Leather unique. Sam and I spend a lot of time together whether it be on trips, at our his & her leather work desks, and throughout the day. And one question that routinely pops up is “what makes our bags special?” The answer is design. Design for us includes every aspect of our bags. It typically starts with a style of product and choice of leather. We spend a lot of time choosing leather. From there, many aesthetic qualities and details are chosen: lining, edge paints and colors, threads, hardware, and details. But this doesn’t quite cover the concept in its entirety. This Silver Gate is a great example of our aesthetic qualities and design at work. While a tote, even in cowhair, is not completely a novel concept, you still know that it is a Beargrass design when you see it. Why is this? In short, it’s the design. Sam’s eye for neutral tones created the marriage of this soft-gray brindle hair and the warm-grey nubuck leather. It also allows our signature cross-stitch in grey thread to pop along the gussets. Even the touch of edge paint along the handle edges create the subtle contrast of a truly finished product. On a long Montana drive this summer, I asked Sam if her products and my products still have matching designs. For example, does the Daily Messenger bag and Big Sky briefcase still match her Sadie and Artemis handbags? The answer is yes. While some designs are more rustic than others, that mostly depends on the choice of leather. Plus, even our more polished designs have a rustic elegance (which is our motto). Rustic Elegance: the ability to elevate organic materials to a sophisticated level without losing its natural wonder. We strive to design elegant/modern/simple styles of leather goods then we let our techniques and leathers provide the levels of rustic appeal. It’s a worthy business model to make leather goods, but it’s the artistic endeavor which drives us to create. Far from forming a few model patterns and hitting the repeat button, we strive to ‘speak’ to the customer the way an artist does. When we construct a handbag, we want the wearer to know they are carrying a one-of-a-kind piece. Part of our M.O. is to learn. We are constantly tinkering and trying new things. Exercising this continual curiosity forces us to learn new skills. New leathers, styles, and techniques which push our design in all sorts of directions yet clearly maintain a sophisticated modern appeal. The value of our brand is our talent for design. Our collective vision and shared aesthetic creates a product that draws few comparisons. At Beargrass Leather, we draw inspiration and insight from the world around us (past and present). However, how our minds perceive that world creates unnecessary distractions that can pull from our artistic vision. Hand-stitched details on this pebbled black Sadie. In my opinion, one of the biggest challenges to maintaining a vision is “noise.” While observing the world is great for insight, one must learn to filter out the noise. Vision in a vacuum is authentic, but it’s tough to be inspired. Vision in a world of clutter is equally challenging. What does noise do? Oh man, the noise prays on the worst of the human instincts. It sows self-doubt or anger or competitiveness. It is simply too easy for the human mind to make assumptions. They look to be so successful… They really look like they are selling more than me today… This bag by someone who started following me three weeks ago looks just like my…. Noise is the killer of vision. Even by posting this, you probably assume that I've established a zen-like ability to block noise. I have not! I’ve created a small list of things to do when surrounded by a world of noise. Step 1: Turn down the volume — When I find myself surrounded by literal noise, I turn off the volume. The same goes for business noise. Put the phone down! Take in less stimuli from a world that seems determined to show that everyone is more successful than you! Step 2: Find your strengths — Finding strengths is deserving of an entire blog page. Most artists can painfully explain each and every weakness. Great artists don’t focus on weakness. They focus on their strength. Nobody ever looks at Picasso and wishes that he was more of an impressionist. Picasso knew his strengths. In short, be you. Step 3: Define your own goals — Don’t let other define your goals for you. That doesn’t mean that you can’t switch goals. But don’t switch simply because everyone else seems to be doing something. List out the pros and cons. Make a decision. But at the end of the day, make your own goals. Step 4: Work to achieve your goals — It’s that simple. Put in the work. I always find that in this part of this, I am ready to get back to my work. Grab some coffee, Buttercup; there is work to do. We are slowly rolling out more masculine items: travel bags, wallets, and belts. All of these can be customized. They also pair with our new monogramming ability. I had to go through so many prototypes that the roll-out has been slowly. If you ever have any questions, email us. We push ourselves. We try new things. We use the whole hide. Who Should Choose Beargrass Leather? This is a question that I ponder all the time. And in short, Sam and I tend to think that we have something for everyone. Yes, we know that a majority of the purses that people purchase are less than $50. However, other than saving more money for one's self, that $50 has little to no additional benefit (locally or regionally). I've done a lot of research into business models, and they are as important for consumers to understand. First, there are two types of enormous business models. There are generic bags designed and produced inexpensively overseas to create a $50 value purse with little of its value helping local communities. The second type are generic designer bags produced in nicer overseas facilities, with better leather (but not always the best leather -- particularly if they spray paint it with a logo). Think about this for a second, why would anyone cover up a premium leather with an acrylic paint? These fetch high dollar based on the logo, name, and company history, but they do little to help local economies. Second, there are American companies and in-house design teams that have their products produced en masse in a country with lower labor costs. They boast an American company (but not an American made product). I find that the costs for these purses are typically directly linked to where the company is located (L.A. companies charge far more than Texas companies). Finally, there are American makers (like us). We design our products and make them one at a time. Even in this model, we are odd exceptions. First, we use no additional help. Second, we use no pre-made patterns that one can buy on the internet for making totes and wallets. Third, we hand-stitch each and every item. Our method is the slowest yet most meticulous. Our prices are nowhere near that designer in France. We are our own customer service and sales department. And an amazing percent of the money spent on a great, handmade purse stays local and in the U.S.
One of my favorite times of the year is coming up, New Year's Day. We reserve this day to make new business goals. I love having a vision! As we meet more and more amazing makers, we are becoming more cognizant of how people measure success. It's critical to set your own parameters for success. Without an internal success compass, one can wander aimlessly. Plus, if you can't define success for yourself, others are happy to define it for you. in addition, makers are on business for the love of making. The selling process is a by-product. Yet, how often do we measure our success in business terms? The view from our porch is a great place to have clear vision on a sunny day! So grab some coffee, a chair, and a notebook, honey! We are going to dream up some fun goals. If any of our Flathead area makers need to borrow our kitchen table and view for their planning, I will provide the coffee or hot cocoa. Let me lead with my bias; bison leather is amazing! There, I said it. Now, why is it amazing? For starters, bison leather is stronger than cowhide. However, we all know that cowhide is strong enough to meet almost all of our purposes; after all, it's leather. The real beauty of bison comes from the grain. Bison leather likes to shrink and make this aggressive pebbling. Bison leather is known for its raised pebbling. Depending on the tannery and the location on the hide of the pebbling, the texture can be large or fine. Plus, all that pebbling helps to make showcase the life of a wild animal. The bug bites, scars, and character marks all make sense on bison leather. This handbag features a tighter pebble with a smoother look. Some bison can be tanned to minimize the natural shrinking. These are some of my all-time favorite leathers. They feature a deep, rich dye and waxy top. One last note, not all buffalo leathers are the same. Notice that I am using the term "bison" for this leather. There is only one animal that can be called bison. However, the term buffalo is used for both the bison and the water buffalo. This might not be a big problem with the exception that water buffalo has been used in commercial leather production for a very long time. 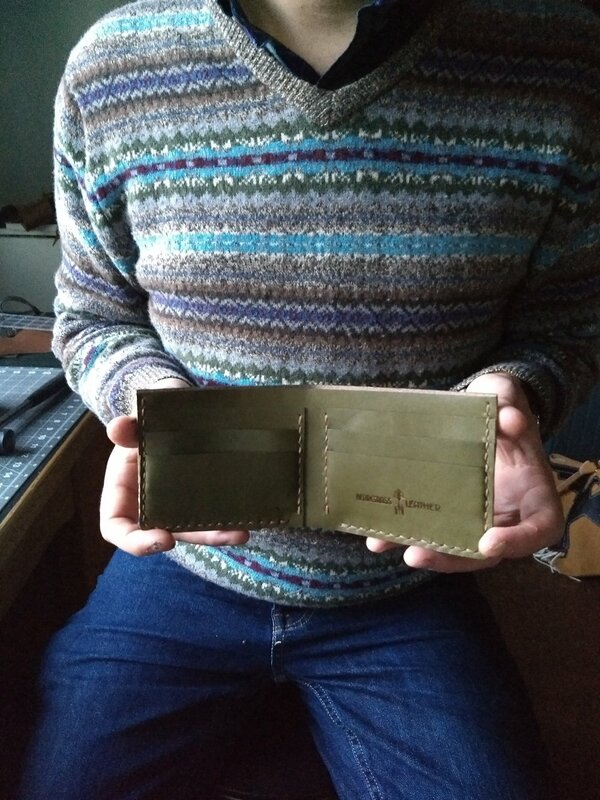 The only way to ensure that your "buffalo" wallet or handbag is "bison" is to order a bison made product. How do Italian leather goods compare to the new wave of American leather goods? When it comes to leather, and leather workers, there appears to be a lot of myths out there. Who better to wade through some of those myths than the folks at Beargrass Leather? This is the myth that I most commonly hear. This myth is mostly false. Almost all leather starts out wet. The tanning process locks in the preservatives that make the leather last for decades. This includes one or all of the following: tannin, oil, and wax. There are as many differing theories on how to treat leather, and they stem from the same confusion as the "wet" myth. In essence, if your leather gets wet, let it air-dry and then treat it with a trustworthy conditioner that matches your type of leather. Leather companies have been playing word games for years. Some common terms are full-grain, top-grain, authentic leather, split, finished split, and bonded. In essence, unless it is full-grain, you aren't getting the best possible leather. For suede, this is slightly different, since there cannot be a full-grain suede in a high quality. But, that's a different post. This would be something similar to a dress maker weaving their own fabric. Most leather comes pre-finished at a tannery. At this point, leather workers rely on the tannery to provide consistent stock of both veg-tanned and chrome-tanned leathers. The tannery is incredibly important. Leather, as a product, can be a tricky proposition. It uses a natural product derived from animals and has a history of pollution (as well as green sustainability). This confusion stems from the production of leather. Top-notch, credible tanneries make all of the difference -- even when it comes to the most natural, vegetable-tanned leathers. A good tannery like Horween, Wicket and Craig, and S. B. Foot can produce safe, top-of-the-line leathers in America. Not necessarily! While it may skip the animal product (which mostly uses the "waste" from the food industry), the chemicals used in the process may be just as bad for the environment and user as chrome-tanned leathers. The most ethical use of leather may be, in my opinion, buying better constructed, longer lasting, timeless leather goods. This, in turn, means reducing the amount of leather goods needed over the course of one's life. It would fit under the "reduce" part of the reduce, reuse, recycle philosophy. These are just some of the myths regarding leather. Plenty more pop up. As they do, we will try our best to shed some light. The leather working process is meticulous. Each step is important. One of the keys for us is to change our designs. Making leather goods that surprise us when finished is paramount. We focus our energies on products that really fit the bespoke label. Each hide of leather we get is one-of-a-kind, and the design should reflect that. 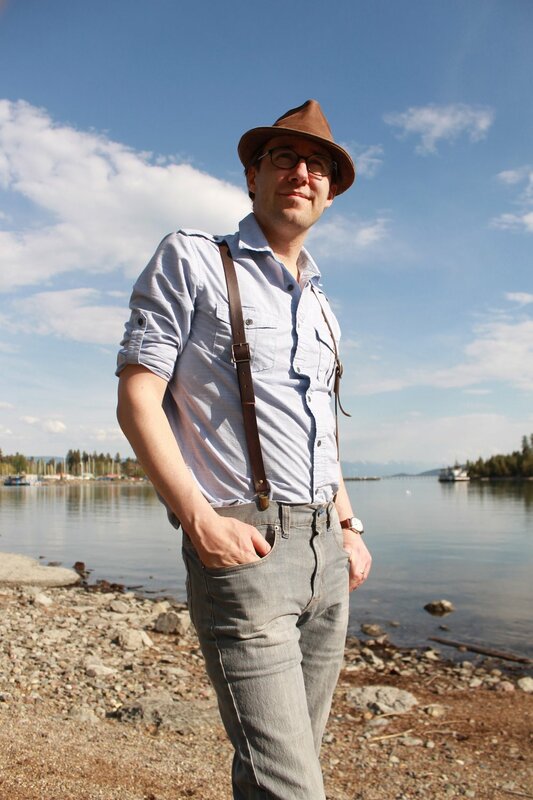 The Beargrass Leather atelier is in Lakeside, MT. But, we do not have a physical shop location. So we are commonly asked where people can find our designs. And the answer represents the singular problem that we are facing. The short answer is that we are in Montana and online through our website shop and Etsy. We are also in some local shops around Kalispell. However, we are currently seeking more locations. We are also near Glacier National Park. We've created a "Stockists" page to help people who are trying to locate Beargrass Leather. 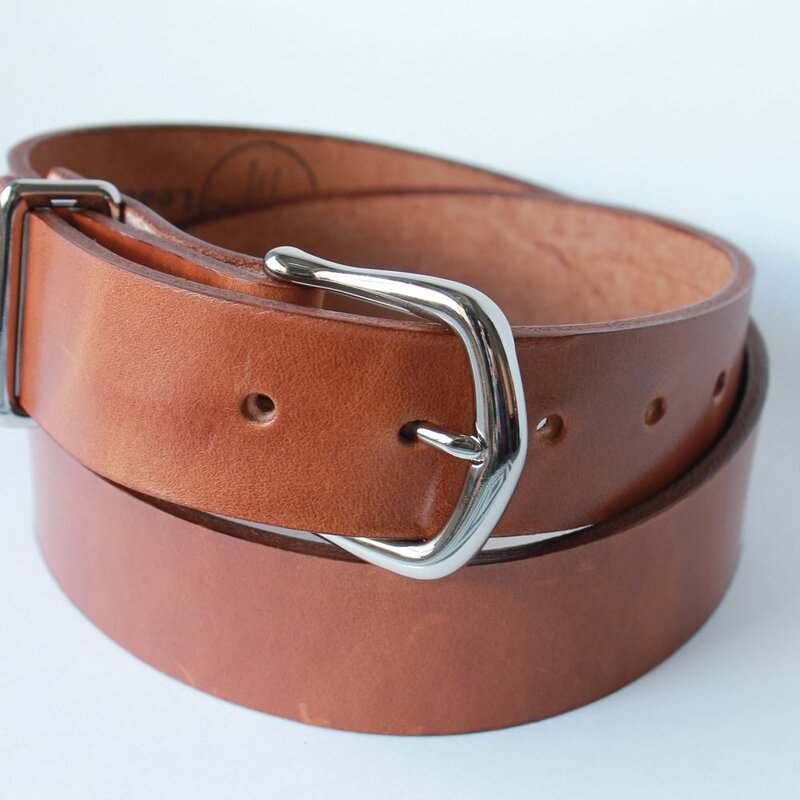 The page also helps stores interested in carrying our incredible leather goods to see our goals for stockists. 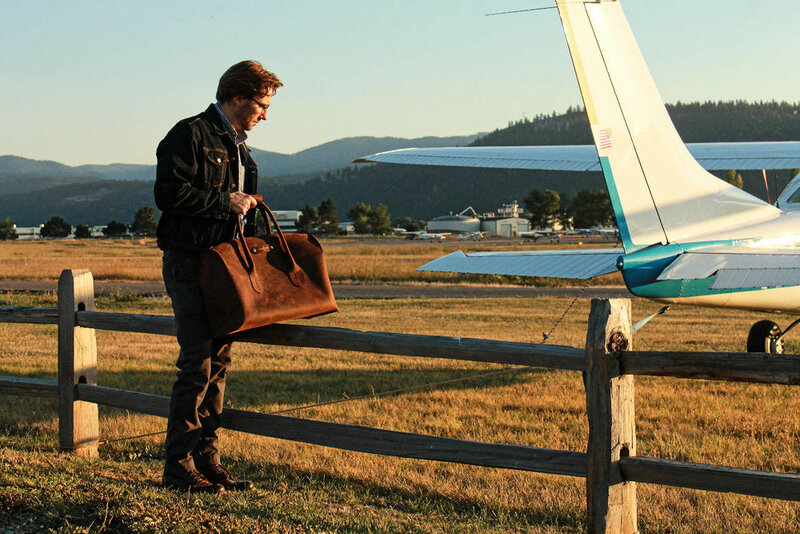 We know that we want to continue to make hand-made leather goods in Montana. But, we also know that the two of us can only produce about 150 handbags a year. So we are selectively trying to form collaborations with singular shops in key cities around the northern Rocky Mountain west: Missoula, Bozeman, Big Sky, and Jackson. Ideally, we want to find boutiques that feature classic designs (because while Beargrass Leather has a bit of a rustic look, our designs are grounded in classic styles). Our happiest customers are those who choose our bespoke designs en lieu of the foreign designer item. If you want to help us spread the word, we would be appreciative. If you are a such a boutique in one of these places (or even a similar place not in the mountain west) and are interested in carrying Beargrass Leather, please let us know. If your a customer who wants to find Beargrass Leather nearby or have an opportunity at something local, please let us know that as well. Okay, so if you've been following Beargrass Leather for a while, you know that we live near Glacier National Park (GNP). It's about 30 miles as the crow flies, but we can see Heaven's Peak and Roger's Peak from our home in Lakeside on a clear day. For a while, we were collecting every possible GNP map available looking for great names. Now GNP has one of two types of names: the best and the worst. For example, Going to the Sun road is the best name for a road ever! But, lake St. Mary leaves a little to be desired. As I was scouring a new map, I found this great moutain -- Old Sun Mountain. How awesome? So when I was inspired to create this extremely Native American inspired hobo purse, this was the name that I went with. What's great about this purse is all of the detail. Here are a couple of interesting facts. First, each feather takes about 45 minutes to create from vegetable tanned leather with watered down acrylic leather paints. Second, embroidery and leather don't naturally go together. Wh would have thought? Since I need to manually perforate each hole in the leather, I had to lay out my design in an arching semi-circle with variable distances from each hole. It took like two hours just to get my design perfect and transferred to the bag. But who is counting? So that is the Old Sun Hobo Purse by Beargrass Leather. It might tread more towards artwork than everyday purse, but it is really amazing. As part of our "What's in a Name?" blog postings, let's talk about the Lakeside Rambler. The Lakeside Rambler has amazing cream colored, soft full grain leather with firm caramel corners, strap, tassel, and lace. This one might be a little bit obvious. We live in Lakeside, MT, and we like to ramble. But, when we use verbs for our bags, it is because it inspires us to move. The Beargrass Leather Duffel called the "Drifter" was one of our favorites. This is also one of our favorites. While we work from our home in Lakeside, we would be happy to meet with anyone passing through. We can set them up on the kitchen table (but might need thirty minutes notice to clean said table -- what with the kids and all). Or, there is a great coffee shop and microbrewery in town which offer great settings for a "showing." 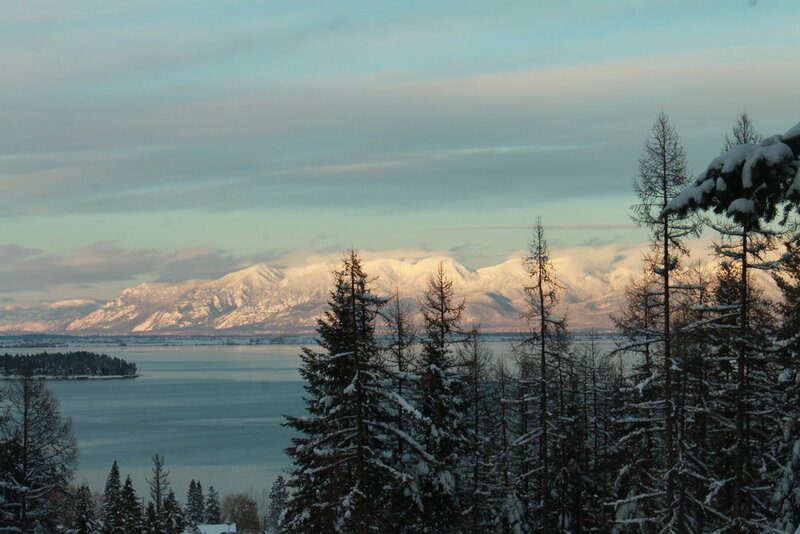 So, if you find yourself travelling up the west side of Flathead Lake, keep us in mind. At Beargrass Leather, sometimes it feels like we are running out of names. Because each bag is a one-of-a-kind original, we go through a lot of names. It does help when we can keep one style, think Sadie, and apply variations to that style. We like to come up with Montana names for our products. After all, our motto is "inspired by Montana, crafted by hand." Let's look at one of my favorite names, the Silver Gate. 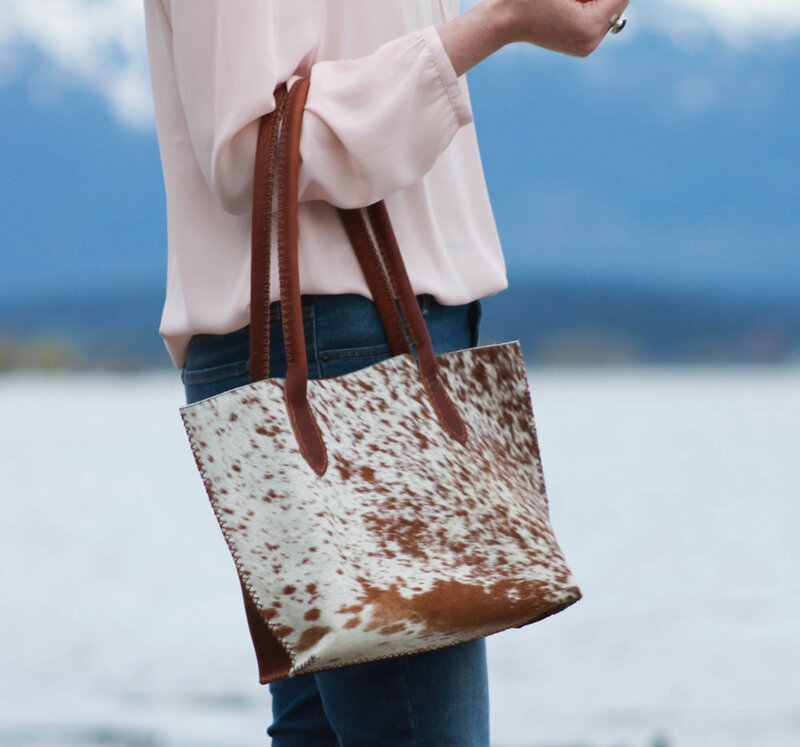 This half and half tote is half bison and half cow hair on hide. At Beargrass Leather, we've been making leather suspenders for three years. It always take a bit of tinkering to get a leather project just right. Like my minimalist, front-pocket wallet, I feel as though my suspenders are perfect. At first, I thought that an all-leather suspenders would be premium. Then I wore a set. They worked. And they were nice. But they didn't work nice. They needed elastic. Here is most of the areas of work in a set of suspenders. I leave the straps unfinished in order to provide custom sizing. The picture above gives a good look at what I call the "yoke." This is the part that holds everything together in the back. The elastic is tough to find. There is black elastic available locally in most markets, but it is tough to find good browns, olives, and patterns in a 1" durable elastic. I have to get this shipped in from a supplier in Turkey. I don't want the yoke angle to be so severe that it causes the front straps to want to spread too much. It's also important to remember that some jeans and pants have the two belt loops in the back while others don't. I can only wear a three strap suspender with this type of jean. 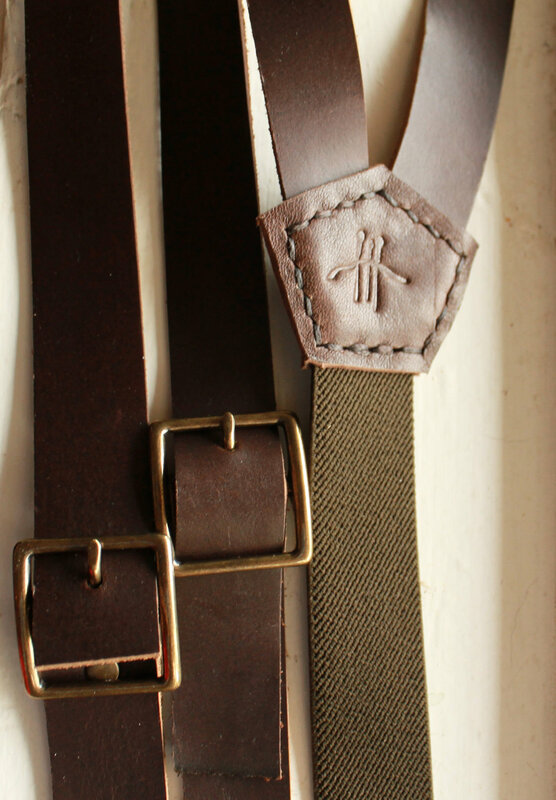 This is a great, rustic style elastic to use with this premium Horween Chromexcel leather and antique brass hardware. Note the absence of a belt. Don't wear a belt with your suspenders unless you want to be labelled as too cautious.